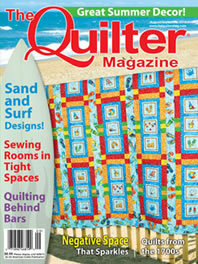 This is a snapshot from The Quilter’s website. I love the styled shot very much. 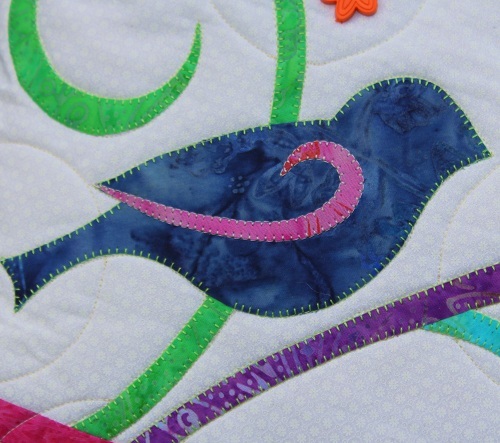 Song of Praise features a blue bird… with a “swoosh” for its wing. In keeping with the non-demanding feel of the project, I substituted the usually “expected” leaves and flowers with just buttons. Sometimes, stitching 40-50 leaves around stems for an applique project is the last thing I want to do when I need a quick to finish project. And, we all have buttons we aren’t using, right? 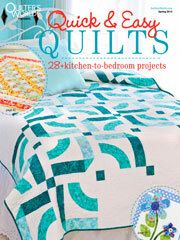 I also meant for this project to entice quilters who have yet to try out applique. 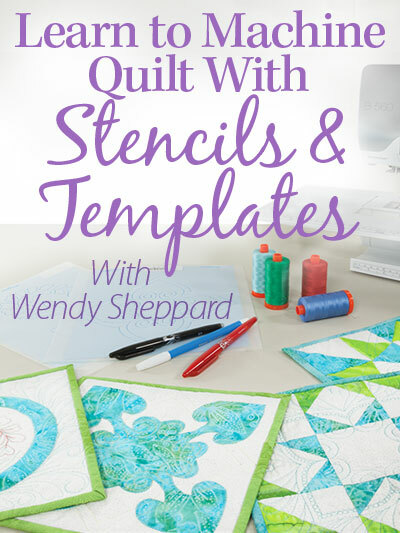 The pieces are few, and easy to to handle… so, if you haven’t tried out applique technique(s), perhaps, Song of Praise could tempt you, even just a bit? 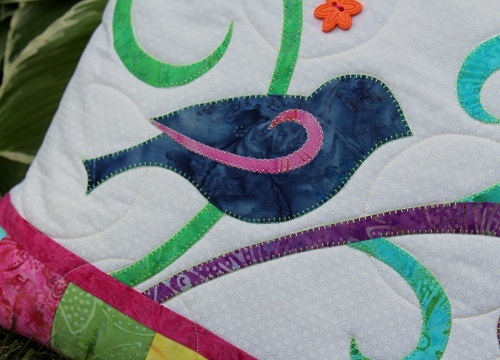 Click here and here to read about my applique tips. I used contrasting Aurifil Mako 50 cotton threads to stitch my blanket stitches (tiny and close together) in finishing the applique pieces. 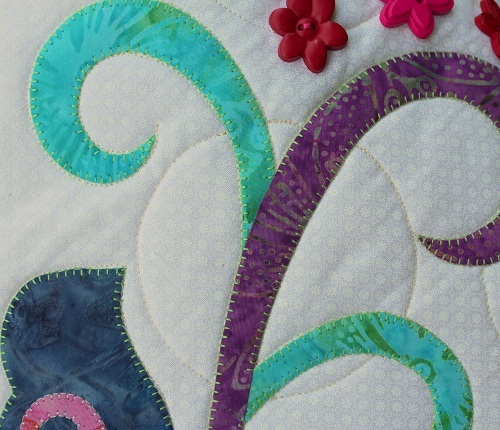 For quilting, I outline quilted around the applique pieces, and quilted circles on the pillow top to keep with the look of simplicity. 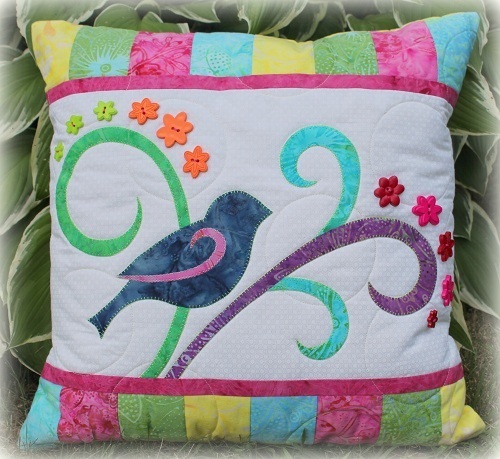 But I think the pillow will take on a fancy look if quilted densely with feathers! 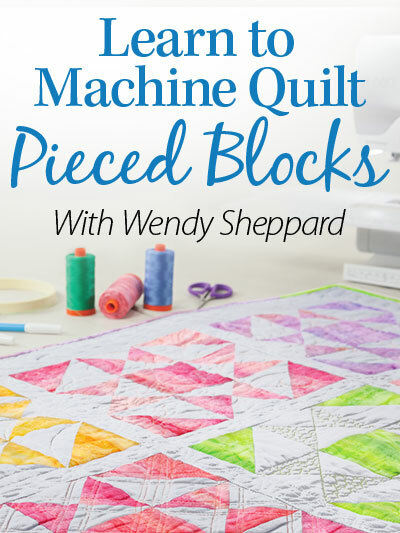 You may click here to read about the method I often use to mark “without marking” simple shapes used as quilting motifs. 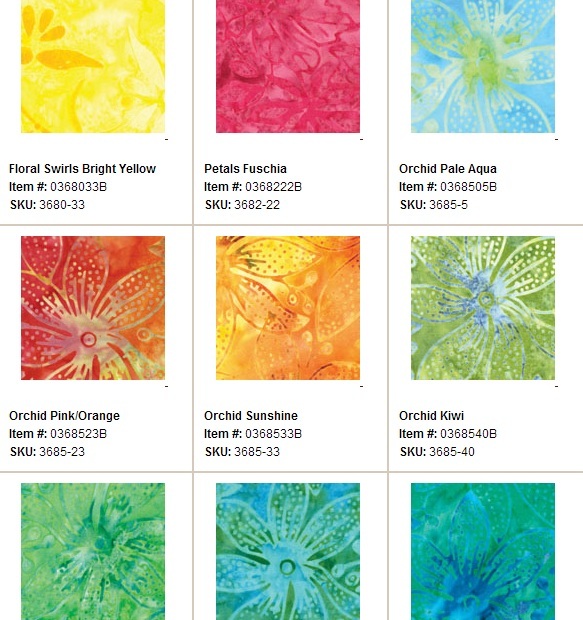 Song of Praise uses fabrics from Benartex’s Rainbow Bright Balis. Click here to view the entire fabric range. You will LOVE the colors, like I have. I hope you have enjoyed Song of Praise, and will continue to enjoy the rest of your summer (or winter for my southern hemisphere friends). Thank you again for stopping by. Happy Monday, and I hope you have a most blessed week! 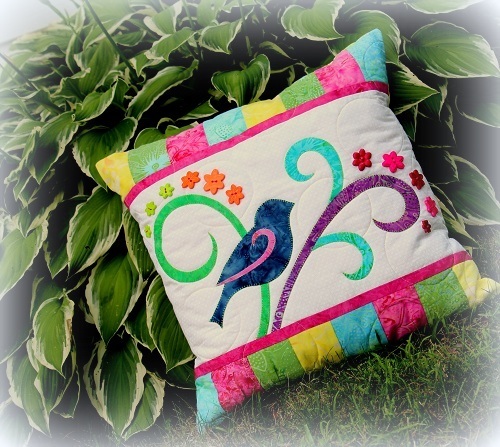 This entry was posted in Quilt Pattern, Quilting, Quilts & Projects: Published, Quilts: Pieced & Applique and tagged Benartex Rainbow Bright Bali Fabric Collection, Bird Applique Pillow, Easy Pillow Project, Machine Fusible Applique, Summer Pillow Project, The Quilter August/September 2014 issue, Wendy Sheppard Designs. Bookmark the permalink. Song of praise is a lovely token of appreciation to our God, Wendy! This is a super cute pillow! Love the bird pillow! Awesome. However may I suggest a black bead for his eye? Oh this is really pretty. Yea, I love the buttons. You could do all sorts of things really, make “leaves” out of lace! 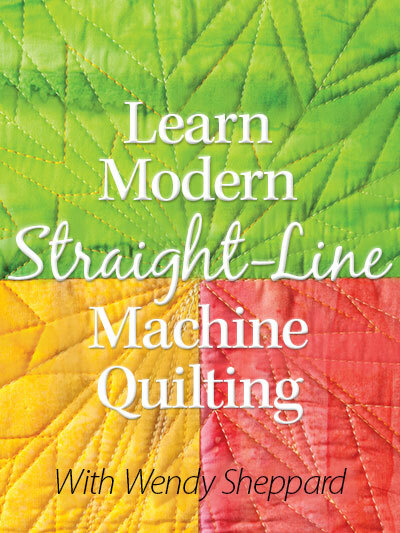 I have not tried applique. We had someone come to our quilt club to, I assumed, show us how to do back stitch applique. I was very excited. 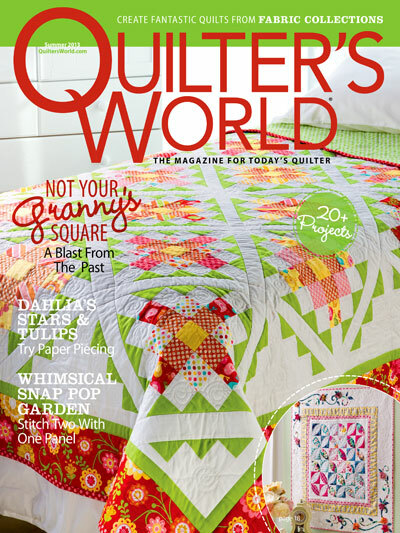 Turns out, she just showed up with every single quilt she ever made from birth and chattered on about how she changed her focus to applique. One and a half hours later, I was disappointed. Her work was nice. 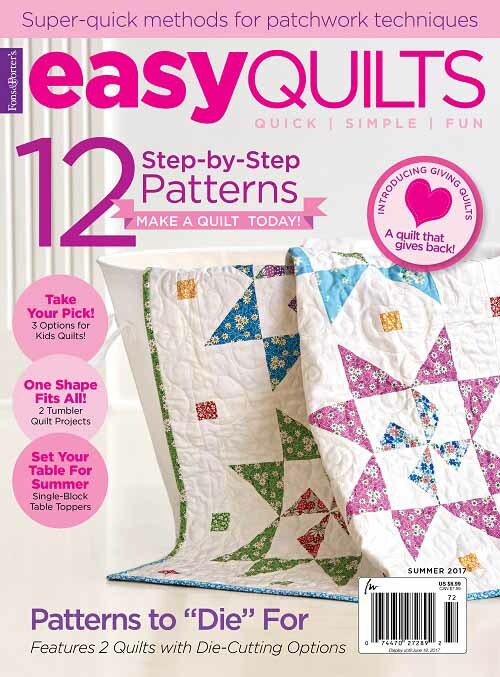 Love both the theme and the pillow’s simplicity…….also, the published photo caught the ‘heart’ of the finish. There are so many different creative pathways this sweet pattern may take and all will carry a special blessing, I am certain. Hugs………………………………. Oh Wendy, this is a winner!!! In its simplicity, it is a beautiful tribute of praise and thanks. Thank you for your continued inspiration. PS..Im headed to the store tomorrow; I want to make one!! 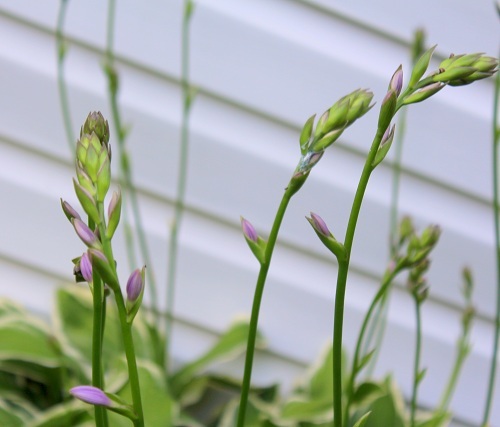 Love the project, Wendy! The fabrics and design are great, and the buttons really add a nice zing! I’m currently working on a needle turn appliqué project begun over two years ago in a class with Karen Kay Buckley. I never appreciated the intricacies of the pattern until I started working on it. It IS fun to see it come together. i LOVE this! Just darling! So cute! and those are great colors!